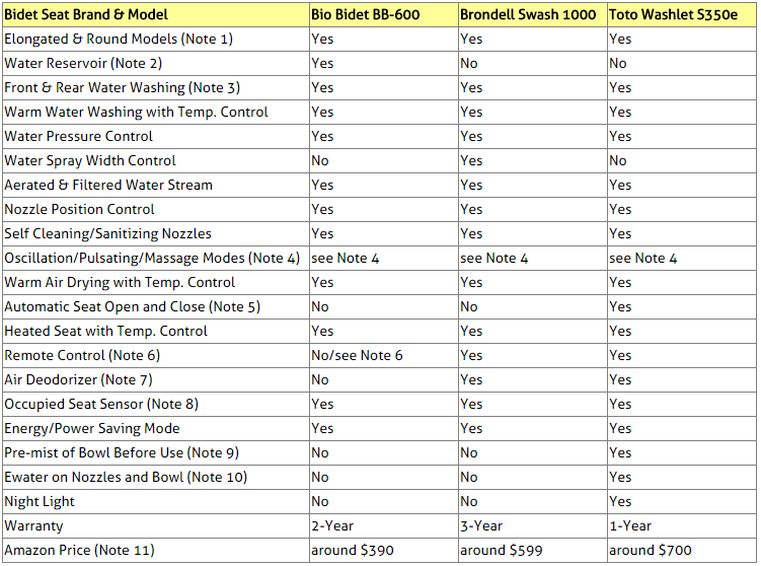 Compare Electric Bidet Toilet Seats: Bio Bidet Ultimate BB-600, Brondell Swash 1000 or Toto Washlet S350e? If you are planning to buy a new home or renovate your current home's bathroom, you may want to consider a bidet style toilet seat rather than a regular one. As opposed to Europe where they are very widely used, bidet style seats have traditionally been not very popular in North America. But this is definitely changing as more and more people are realizing the sanitary benefits of using water instead of simply toilet paper to clean up in the bathroom. A bidet toilet seat is not a toilet seat and is not a bidet. It's both! Better than a conventional toilet seat and better than a conventional bidet which is usually separate from the toilet seat, the bidet toilet seat provides both functions integrated into one piece of equipment. It provides a soothing and cleansing personal hygienic wash, reducing or eliminating the need for dry and ineffective toilet paper. It delivers gentle and effective posterior wash as well as feminine wash which offers many benefits to menstruating and pregnant women, leaving them with the shower fresh feeling after each use. It also offers senior citizens and those suffering from debilitating illnesses, such as arthritis, hands-free bathroom cleansing that can provide independence. ​Finally, it is easy to install. You just need to replace the existing toilet seat with the bidet seat and connect it to both the water line and an electrical outlet. Rear and front washing (= posterior and feminine). Warm water washing with temperature control. Nozzle position control with self cleaning nozzles. Warm air drying with temperature control. Heated seat with temperature control. ​Aerated & filtered water stream. Automatic seat open and close. 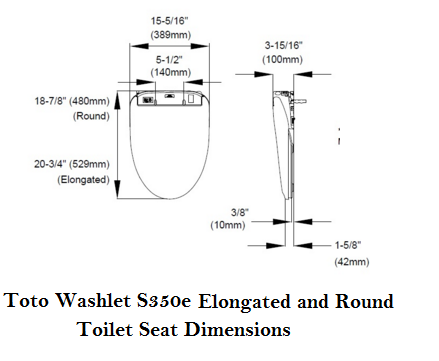 This article will compare bidet seats Bio Bidet Ultimate BB-600, Brondell Swash 1000 and Toto Washlet S350e. These were not just the most popular among Amazon customers at the time this article was written, but they had also received excellent reviews from most Amazon buyers. 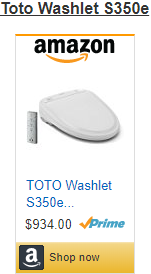 Selected Bidet Toilet Seats on Amazon. Bio Bidet has a water tank while Brondell and Toto bidet seats have none (note that the water tank mentioned here is not the one containing the flushing water, but the posterior cleansing water). When there is no tank the water is instantly heated to the selected temperature. ​All three bidet seats considered here provide both posterior and feminine (rear and front) washing. Bio Bidet and Brondell are equipped with two nozzles, one for the rear cleansing and the other for the front. Toto has a single nozzle that is used for both the rear and front cleansing. The system adjusts the nozzle length depending on which type of cleansing is chosen. Further adjustments of the nozzle length can be achieved using the Remote Control device. This works very efficiently. Bio Bidet provides both oscillation and massage (pulsation) modes. During massage mode, water sprays out evenly and the wand moves up and down, while during oscillation mode, the water gets quick air bursts as the wand moves up and down. Blondell provides an oscillation mode that moves the wash nozzle up and down to during a wash cycle. It can be invoked during either the rear or front washing cycles. ​Toto provides both oscillation and pulsation modes. During pulsation mode, water pressure is raised and lowered continuously, while in oscillation mode the water pressure is constant, but the nozzle moves up and down. Only Toto provides the automatic seat open and close function. As you approach the bidet seat, the top lid senses it and lifts automatically. Shortly after you leave, the lid closes automatically. There is an option to automatically open both lid and seat or just the lid. However, if you choose to just auto open the lid and manually open the seat, they will both close automatically. 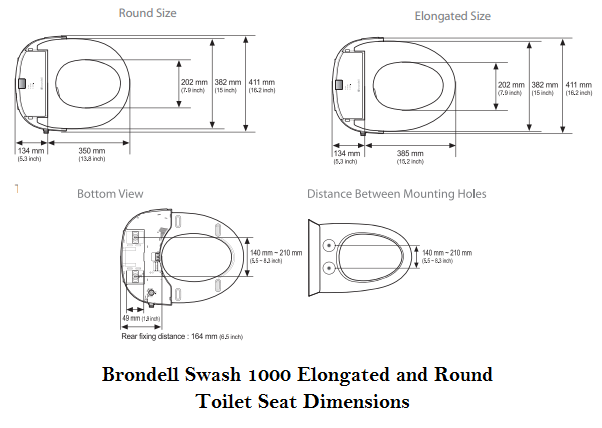 Though Brondell and Bio Bidet don't have the automatic seat open/close function, they are equipped with a slow closing seat and lid that shut gently on your toilet without making a sound. Brondell and Toto come with a Remote Control device. 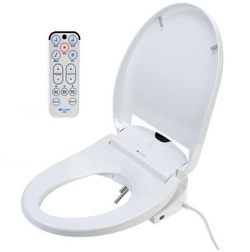 However, the bidet seat itself has also a small control panel where some basic functions such as rear and front cleansing can be invoked when the remote control device is not available or has low battery power (see description images above). Bio Bidet does not come with a Remote Control device, but its control panel is conveniently positioned on the seat for invoking the various functions it provides. Both Brondell and Toto are equipped with an automatic air deodorizer. It is an electronic way of deodorizing the air. The occupied seat sensor offered by all three products considered here is a safety feature that keeps the seat from operating when it's not being sat on. Only Toto pre-mists the toilet bowl with water before use. This make flushing more efficient and effective compared to flushing a dry bowl (no sticking stuff on the bowl!). This feature mists the toilet bowl with electrolysed water which keeps the bowl cleaner and avoids any requirement for harsh chemical cleaners. The Amazon prices shown were in effect at the time this article was written and may have changed. For exact prices, please refer to the Amazon products section below. Note that the Amazon price often includes a huge discount to the list price. If a discount exists, both the Amazon price and the list price will be displayed when you click the Amazon product link images below. ​So which of the three bidet seats to buy? 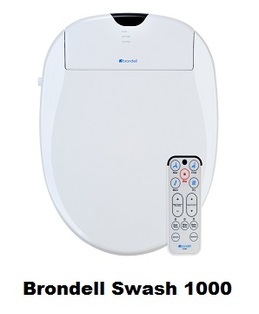 Only Brondell Swash 1000 and Toto Washlet S350e come with a Remote Control device and are equipped with a deodorizer. Bio Bidet BB-600 is equipped with a side control panel. Note also that Bio Bidet uses a small reservoir to keep and warm the cleansing water, while both Brondell and Toto use no tanks and provide instant water at the selected temperature. Pre-mist of bowl before use. E-water cleaning of nozzles and bowl. Otherwise, there is a good chance that you would be quite happy with anyone of these three products, as each of them provides the essential features mentioned in the above introduction as well as some of the nice-to-have features such as aerated and filtered water stream, energy saving mode and occupied seat sensor. Please click the bidet seat of your choice below for price information or to purchase. Note that if some of the prices are not shown on the Amazon link images below, they will be provided once you click the images.